A steel blue used for bluing home-made snake guides. It’s also used by many rodmakers and two major component firms for bluing nickel silver components. This is our favorite solution, though we’ll be the first to admit that its use requires immense cleanliness, practice, and good timing. Learning how to apply Oxpho-Blue successfully is well worth the time you’ll invest. In most cases you’ll want to clear coat your blued parts with a lacquer finish. Alternately, depending on the use the part will see, you can oil the part, just as you would a fine knife or firearm. Some fellows prefer to oil a blued reel seat on a rod that will see lots of use….it’s easy to remove the oil, re-touch the bluing at season’s end, and re-oil. Just bear in mind that you should never oil any parts until after the rod is completely assembled and ready for use. Oxpho-Blue is a wonderful solution for identifying otherwise perfectly hidden pins in pinned ferrules. Imagine that you’re about to restore a classic rod. You’re not sure if it was pinned by the original maker. 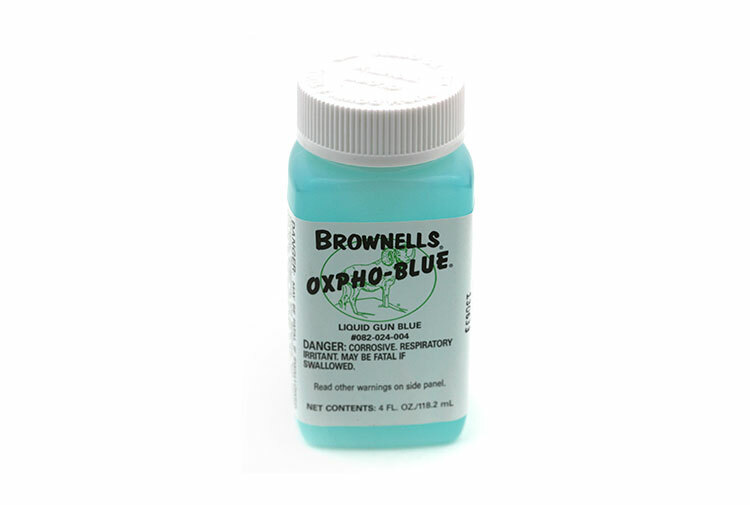 Not a problem…blue the ferrule by applying Oxpho with a cotton swab and watch the surface as you spin the rod section in your hand. The pins will blue at a different rate than the rest of the ferrule, so you’ll be able to spot them easily.